in BPSC GMC Recruitment 2017. Candidates who are having required qualification they can submit their application online for this BPS GMC Staff Nurse Jobs online through official website of www.bpsgmckhanpur.ac.in. Online application link will activate from 29-04-2017 and closing date is 28-05-2017. Candidate must have registered with Haryana Nursing Council. Only online applications will be accepted for this Staff Nurse jobs of BPS Govt Medical College. For more details of BPS GMC Staff Nurse Jobs Recruitment age limits, qualifications, salary selection process and more related information is given below. 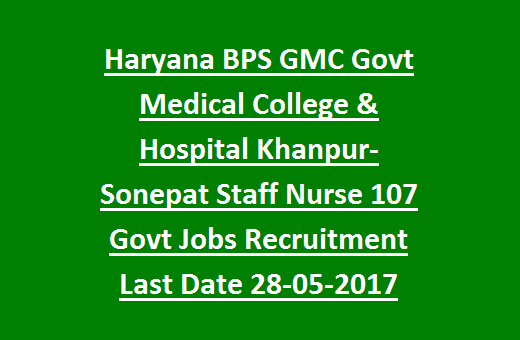 Total 107 vacancies available in BPS GMC Khanpur Paramedical Staff Jobs Recruitment. Post Name and available vacacny details of BPS Governemnt Medical College is given below. Age limits are applicable as per the Govt Norms of Haryana. For Staff Nurse: Diploma in GNM Course or B.Sc /M.Sc Nursing or GNM Course from a recognized university and should have registered with Haryana Nursing Council. knowledge of Sanskrit or Hindi languages are mandatory. For General candidates application fee is Rs.500/- and for others and women candidates Rs.250/-. Selection for Staff Nurse Jobs Recruitment of BPS Govt Medical College & Hosptial will be based on Merit in qualifying examinations and experience. A merit list will be prepared based on candidates marks percentage, experience and other information. Those selected candidates only called for personal interview or document verification. 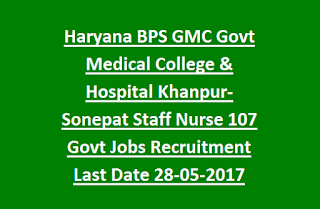 For the post of Staff Nurse in BPS GMC hospital Khanpur candidate must have submit application form online through official website of www.bpsgmckhanpur.in on or before 28-05-2017. Submit application online and after submission take a printout and attach the all self attested required documents and kept it safe. At the time certificate verification you have to produce the same along with original certificates.